Amblyopia is poor vision in an eye that did not develop normal sight during early childhood. It is sometimes called “lazy eye.” When one eye develops good vision while the other does not, the eye with poorer vision is called amblyopic. Usually, only one eye is affected by amblyopia, but it is possible for both eyes to be “lazy.” The condition is common, affecting approximately two or three out of every 100 people. The best time to correct amblyopia is during infancy or early childhood. Newborn infants are able to see, but as they use their eyes during the first months of life, vision improves. During early childhood years, the visual system changes quickly and vision continues to develop. If a child cannot use his or her eyes normally, vision does not develop properly and may even decrease. After the first nine years of life, the visual system is normally fully developed and usually cannot be changed. The development of equal vision in both eyes is necessary for normal vision. Many occupations are closed to people who have good vision in one eye only. People with amblyopia in one eye are more than twice as likely to lose vision in the healthy eye from trauma. If the vision in one eye should be lost later in life from an accident or illness, it is essential that the other eye have normal vision. For these reasons, amblyopia must be detected and treated as early as possible. It is recommended that all children have their vision checked by their pediatrician, family physician, or ophthalmologist (Eye M.D.) at or before their fourth birthday. Most physicians test vision as part of a child’s medical examination. They may refer a child to an ophthalmologist if there is any sign of eye problems. New techniques make it possible to test vision in infants and young children. If there is a family history of misaligned eyes, childhood cataracts, or a serious eye disease, an ophthalmologist should examine the eyes during infancy. Refractive errors are eye conditions that are corrected by wearing glasses. Amblyopia occurs when one eye is out of focus because it is more nearsighted, farsighted, or astigmatic than the other. The unfocused (blurred) eye “turns off” and becomes amblyopic. The eyes can look normal, but one eye has poor vision. This is the most difficult type of amblyopia to detect since the child appears to have normal vision when both eyes are open. Amblyopia can also occur in both eyes if both eyes have very blurred vision. This can happen when there is a high amount of nearsightedness, farsightedness, or astigmatism. An eye disease such as a cataract (a clouding of the eye’s naturally clear lens) may lead to amblyopia. Any factor that prevents a clear image from being focused inside the eye can lead to the development of amblyopia in a child. This is often the most severe form of amblyopia. It is not easy to recognize amblyopia. A child may not be aware of having one strong eye and one weak eye. Unless the child has a misaligned eye or other obvious abnormality, there is often no way for parents to tell that something is wrong. Amblyopia is detected by finding a difference in vision between the two eyes or poor vision in both eyes. Since it is difficult to measure vision in young children, your ophthalmologist often estimates visual acuity by watching how well a baby follows objects with one eye when the other eye is covered. Using a variety of tests, the ophthalmologist observes the reactions of the baby when one eye is covered. If one eye is amblyopic and the good eye is covered, the baby may attempt to look around the patch, try to pull it off, or cry. Poor vision in one eye does not always mean that a child has amblyopia. Vision can often be improved by prescribing glasses for a child. Your ophthalmologist will also carefully examine the interior of the eye to see if other eye diseases may be causing decreased vision. other disorders of the inner eye. To correct amblyopia, a child must be made to use the weak eye. This is usually done by patching or covering the strong eye, often for weeks or months. Even after vision has been restored in the weak eye, part-time patching may be required over a period of years to maintain the improvement. Glasses may be prescribed to correct errors in focusing. If glasses alone do not improve vision, then patching is necessary. Amblyopia may also be treated by blurring the vision in the good eye with special eyedrops or lenses to force the child to use the amblyopic eye. Amblyopia is usually treated before surgery to correct misaligned eyes, and patching is often continued after surgery as well. If your ophthalmologist finds a cataract or other abnormality, surgery may be required to correct the problem. An intraocular lens may be implanted. After surgery, glasses or contact lenses can be used to restore focusing while patching improves vision. Amblyopia cannot usually be cured by treating the cause alone. The weaker eye must be made stronger in order to see normally. Prescribing glasses or performing surgery can correct the cause of amblyopia, but your ophthalmologist must also treat the amblyopia itself. Children do not like to have their eyes patched. But as a parent, you must convince your child to do what is best for him or her. Your interest and involvement will be necessary for successful treatment. If the problem is detected and treated early, vision can improve for most children. Amblyopia caused by strabismus or unequal refractive errors may be treated successfully during the first nine years of age. After this time, amblyopia usually does not recur. 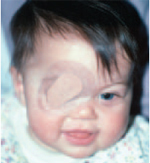 If amblyopia is not detected until after early childhood, treatment may not be successful. Amblyopia caused by cloudiness of the eye tissues needs to be detected and treated extremely early-within the first two months of life-in order to be treated successfully. If you have additional questions or would like any further information, contact your ophthalmologist.